Ein alter Bekannter hier im Soundpark jetzt mit neuem Pseudonym, Release auf Etage Noir Records und einem Remix für die weißrussische Rockband 'Indiga'. Zitat: "Lives and works in Linz/Austria. Andy Korg, also known as "The fat king" and as a member of the Adalbert Günther Trio, dedicates his music to pop-influenced aspects of breakbeats and house. On the one side, his productions with slower beats, very often accompanied by vocals, convince through catchy melodies and are well balanced. On the other side his dancefloor-oriented tracks are very functional and show that they are approved in live-sets. 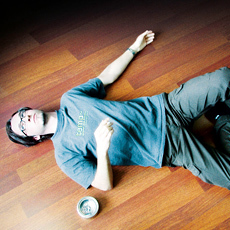 After Andy Korg came to the attention of the public with some net-releases, in 2005 his contribution to the Radio FM4 Sound-Selection became an underground-hit with extended airplay in the Austrian radio. In 2006, he released his debut single on etage noir." die neue vinyl single 'bitcrusher' erscheint am 5. september auf etage noir special. auf soulseduction.com darf man aber auch schon gerne preordern. Andy Korg ist bitte ein Top-Name! Hübsche Nummer außerdem, mit ein bissl Old-School-Sampling-Flair, wie ich's zur Zeit auch wieder fesch finde. hat eine sehr kühle Begleitung. Das sind Echtklänge und die Soli klingen nach locker eingespielt, doch scheint das dann zu stark quntisiert worden zu sein. So klingt es zu wenig menschlich, zu wenig warm, zu elektronisch.